George Washington Vanderbilt, inheritor of part of the huge Vanderbilt fortune accrued by his grandfather, steamship and railroad magnate Cornelius Vanderbilt, first visited Asheville in 1889 for health reasons. Although remote, the area around Asheville functioned as the center for a growing health industry that capitalized on good water, a pleasant climate, and a relaxing atmosphere. George Vanderbilt seemed to have little interest in his family's business. He was, however, an accomplished scholar, with a special interest in languages, philosophy, literature, architecture, and landscaping. Inheriting his father's appreciation of art, George often accompanied him on buying trips. He fell in love with the western North Carolina mountains and chose to build a southern country home in an area near the village of Best, just south of Asheville. Upon completion, Vanderbilt's "country home" included 255 rooms and over 125,000 acres of property, the largest residence ever built by a private citizen in the United States. Vanderbilt purchased the town of Best in 1889 and renamed it Biltmore Village. The name Biltmore derived from "Bildt," the region in Holland from which the Vanderbilt family originated, and "more," an old English word for rolling upland country. When Vanderbilt purchased Best, it consisted of a railway station, two small inns, a gristmill, and a few homes. By 1896, construction of Biltmore Village was under way, and the new village included cottages, shops, carpentry and other traditional craft schools, an Episcopal church, a post office, a laundry, a hospital, and the Biltmore Office Building. Architect Richard Morris Hunt, designer of New York's Tribune Building and the base of the Statue of Liberty, modeled Biltmore Village after a Swiss village. Vanderbilt originally had no style in mind for his house. When Hunt arrived, he and Vanderbilt agreed that the property, located where the Swannanoa and French Broad Rivers meet, resembled the French Loire Valley. The site's similarity to the French region prompted the house's Francis I style, reminiscent of sixteenth-century chateaux in the Loire Valley. Hunt equipped the chateau with all the modern conveniences possible, and he and Vanderbilt went on buying trips to supplement Vanderbilt's existing collection of art, books, and antiques. Well known for his problem-solving ability, Hunt fulfilled his client's extravagant requests. Vanderbilt wanted his house on a promontory with a back porch looking out onto a view of Mount Pisgah, even though he chose a site in a valley. Hunt suggested a plan to fill in the valley and build Vanderbilt's promontory, and workers hauled sufficient rock and soil to create a hill on which to build the house. g them to landscape designer Frederick Law Olmsted. Best known for designing New York City's Central Park, Olmsted achieved a greater triumph at Biltmore, a property nine times larger than Central Park. Olmsted drew plans for formally landscaping the 200 acres immediately surrounding the house, laying out the English Walled Garden, the Italian Garden, and a manmade lake called the Lagoon. He also planned to refurbish forests and create farms and a nursery on the rest of the land. Gifford Pinchot managed the reforestation project. The first trained forester in the United States, Pinchot planned New York State's Adirondack Park and founded the U.S. Forest Service. Vanderbilt's forest, named Pisgah Forest, began about 10 miles from Biltmore and extended 60 miles to the west. Pinchot established the Biltmore Forest School and developed a comprehensive plan to continue the tree nursery, reforestation, and harvest projects. His principles of sustained yield, which struck a balance between cutting timber and growing new trees, first developed at Biltmore and remain standard practice in forestry today. The estate also had a dairy farm, a pig farm, and a poultry farm on site. Construction of the house, completed by hundreds of laborers, took place between 1890 and 1895 and provided employment for much of the local population. Workers built a spur railway to bring in supplies from the depot in Biltmore Village to the construction site three miles away. Limestone, the fundamental building stone used in the house, was shipped from Indiana, and workers built a brick factory and a woodworking factory on site as well. The finished masterpiece included walk-in refrigeration, electricity, advanced plumbing, and central heating, all at a time when many of Vanderbilt's neighbors still used outhouses. The house was officially opened on Christmas Eve 1895, with 350 family members and friends in attendance. Stacks of gifts for employees' children stood under a 30-foot Christmas tree in the enormous banquet hall. The party set a precedent for entertaining at Biltmore, and in following years, the house became a haven of amusement for the Vanderbilts-George Vanderbilt married Edith Stuyvesant Dresser in 1898, and their only child, Cornelia, was born in 1900-and their wealthy friends. Guests enjoyed formal dinners and balls, or slipped into the extensive library for reading and study. The gymnasium, bowling alley, swimming pool, and ping-pong table provided a variety of diversions. Outdoor activities included hunting, fishing, riding, hiking, croquet, archery, and strolling the grounds. The Vanderbilts' lifestyle at Biltmore depended tremendously on the service staff, with about 80 servants required to run the house and stables efficiently. In later years, the Vanderbilt family spent more and more time away from the estate. The 1902 depression hit the family fortune hard. With Biltmore's operating costs reaching roughly $6,000 a month, the family shut down the estate and sailed to Europe. Despite the financial crisis, Mrs. Vanderbilt later set up a school at Biltmore to teach domestic arts and crafts to local women. George Vanderbilt died in March 1914. His daughter Cornelia inherited a trust fund left by her father, while Edith inherited Biltmore's house and lands. Edith sold the federal government a large part of Pisgah Forest, which now makes up the core of Pisgah National Forest, reducing the Biltmore property to a more manageable 8,000 acres. A flood destroyed Olmsted's nursery in 1916, but the dairy thrived and paid for the estate's maintenance. 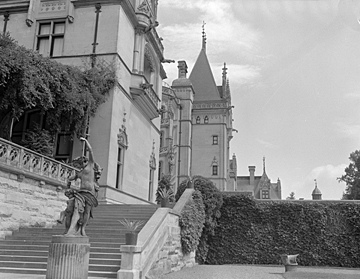 Cornelia married British diplomat John Francis Amherst Cecil in 1924, and their sons George and William spent much of their childhood at Biltmore. Edith married Senator Peter G. Gerry in 1925 and moved out of Biltmore, leaving its operations to the Cecils. During the First World War and the Great Depression, Junius Adams, a local judge, was employed to manage the property. He incorporated Biltmore and opened the house to visitors for the first time in 1930. Edith died in 1958, and in 1960 the Cecil sons split the Biltmore property. 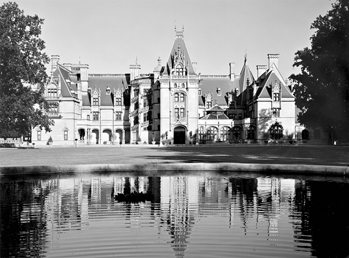 George took the dairy and a portion of the estate, while William took the house and the part of the estate known as Biltmore Forest. William became head of the Biltmore Company and a leading historic preservation advocate. Although the U.S. government has declared Biltmore a National Historic Landmark, it operates without federal grants or subsidies and pays property taxes. The property also contributes significantly to the economy of Asheville and western North Carolina. Roughly 750,000 visitors each year come to the estate and take the self-guided tour, which includes 85 rooms of the house as well as the grounds. Mead Parce, Twice-Told True Tales of the Blue Ridge and Great Smokies (1995). Susan M. Ward and Michael K. Smith, eds., Biltmore Estate: House, Gardens, Winery (1990). Robert Wernick, "Here's the House that Lots and Lots of Jack Built," Smithsonian (September 1992). Biltmore House, Asheville, NC, 1950. From North Carolina Conservation and Development, Travel and Tourism photo files, North Carolina State Archives, call #: ConDev8333B. Available from http://www.flickr.com/photos/north-carolina-state-archives/4821472528/ (accessed June 13, 2012). North Carolina State Board of Agriculture. North Carolina and Its Resources. Winston: M.I. & J.C. Stewart, Public Printers and Binders. 1896. [52-53]. https://archive.org/details/northcarolinaits1896stew (accessed May 23, 2014). Hi, what is the monthly cost of maintaining those beautiful gardens? The article attributes Biltmore Forestry School to Pinchot. I believe that it was Carl Schenck who founded the school. Is there a map showing all the land of the original Biltmore Estate? Thank you for visiting NCpedia and for asking this question! 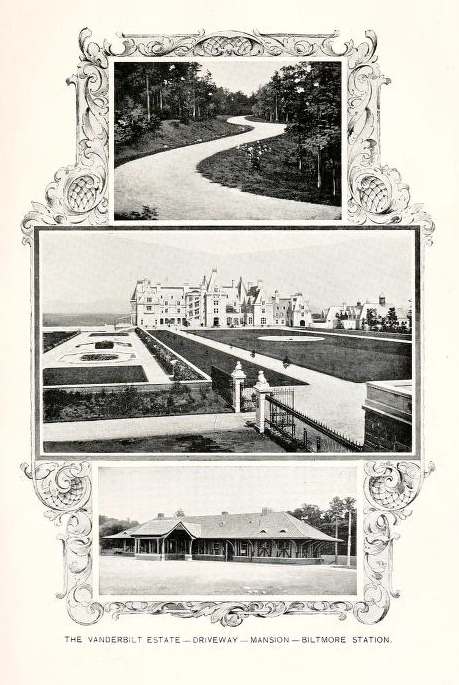 Here is a link to a site that has an image of a Guide Map of the Biltmore Estate -- http://scenariojournal.com/article/deep-roots/ and they credit the National Park Service’s Frederick Law Olmsted Historic Site for the collection. Olmsted was the designer of the Biltmore estate. You may want to contact the National Park Service site for more information about the map and their archives. Here is a link to the site: https://www.nps.gov/frla/index.htm. What are the annual expenses for running the estate? My wife heard from an employee that it was $55 billion, a number that I cannot believe. That's a really good question! Unfortunately, NCpedia does not have any additional information on the current financial status of the Biltmore Company. You may want to visit the Biltmore website at http://www.biltmore.com/ for more information as well as their contact information.